On Saturday I took my family on the one-hour drive to Newark, NJ, for the express purpose of lunch at Hobby’s Deli and Restaurant. It had been years since I had a great corned beef and pastrami sandwich and on Saturday morning I happened to have stumbled on some web reviews of Hobby’s that prompted the visit. Why drive an hour for a sandwich? Anyone who understands that sandwich – done properly – knows why! I had no expectations of learning anything special and certainly had no plans to write a blog post. But after a delightful late lunch at Hobby’s with my family, I’m compelled to share some of the experience and what it highlighted to me about business. 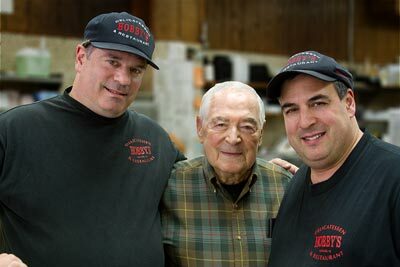 The principles exemplified at Hobby’s can be useful to anyone who serves customers, and let’s face it, on some level we all do. Hobby’s is located in the busy, noisy urban section of Newark. We parked in the rear of the building and navigated some construction to the front door. There we were noticed Michael Brummer – who looks just like his picture (he’s on the right). He was watching some workers install a concrete sidewalk, and we immediately struck up a conversation. It was an hour before closing and the restaurant was not busy. He welcomed us inside, and came to understand it was our first visit. He was clearly passionate about the business and told us the story of his family’s history there. He was proud of the food, and respectful of his staff. He made no pretense to be anything more (or less) than what he was – a guy running a family restaurant who really, really cared about our experience there. Michael personified what I think of as an authentic business owner. Good people hire (and keep) good people. And our waitress was good people! She arrived on the scene with a smile and was very helpful as we navigated the many choices on the menu. She was patient with the kids, authoritative when necessary, and she volunteered additional information and service. She packed some doggy bags and was warm and inviting throughout. The chicken soup was great. I asked Michael how he got the intense flavor and he said, “Lots of chickens!” The corned beef and pastrami was piled high on rye and just melted in your mouth. My wife commented that the bacon had a delicious smoked flavor and Michael replied that the bacon costs more, but makes for a better sandwich. Overall, the quality of the food let you know you were getting great value. But this post isn’t about food, it’s about business. And whether the business is a restaurant, retail store, manufacturer, or software company, these three principles are to me, the difference between operational mediocrity and operational excellence. And once you’re aware of them, you even can spot them in a corned beef and pastrami sandwich!